First week of grad school proper over, and I’m still here with what sanity I had to begin with. Such as it is. I like it, although this whole online classroom thing really weirds me out. Yes, I know, it’s sort of like blogging. But still. One thing I’ve learned is that there comes a time where I have to pull the plug. When I had in person classes, they stuffed the students into the classroom when it was time for class to start, and then shoved them out when class was over with a paper saying do this before it’s time to stuff you back in the classroom again. Do your homework and you can do what you’d like until the next class. After 5 years, that’s what I was used to. Now, the classroom is there 24/7, and so is the work. Do a little of this, a little of that, and then I realize I’ve played through two and a half albums in my iTunes and my eyes are starting to cross. It took me a few days, but I think I’ve gotten to where I can catch myself and pull the plug before hitting that point. 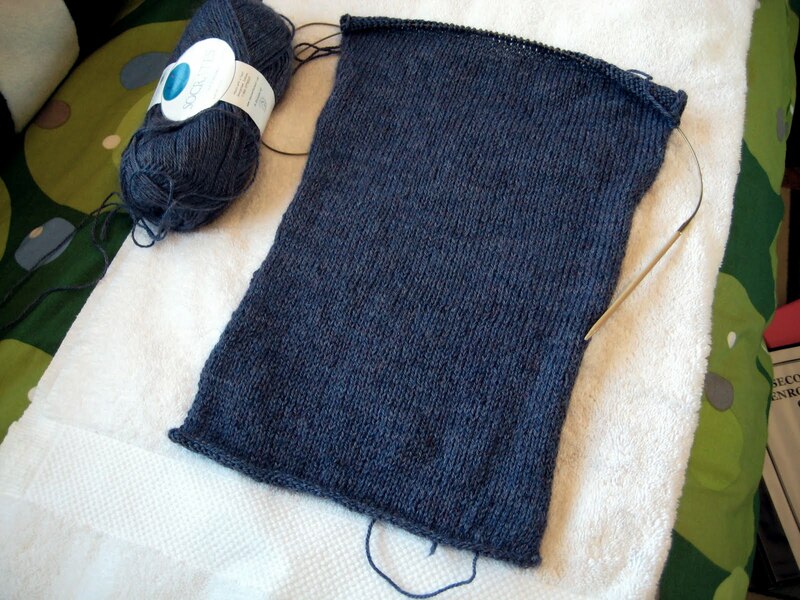 So when I step back, I pull out my newest project: the Tundercloud Cardigan. The pattern is Tempest, from Knitty, and so called because of the color of the yarn–blue with gray but a little purply too, like the color the sky would turn before a storm in Illinois. As an aside, the sky don’t turn that many colors here. There were blues, grays, and purples, and I distinctly remember several instances where the sky went green in Illinois, but I have never seem a green sky here. Maybe it has something to do with there being moisture in the air… Like with many great colors of yarn, I wasn’t able to get the color to show up properly in the photo above, but I’ll keep trying. This sweater is for Mum, and you know what that means: Christmas knitting has begun! Having a gift on the needles is perhaps the only thing that will reliably get me to step back from school when I need to. Will I get it all done in time? That’s the sport.